Sep 16, 2017; Las Vegas, NV, USA; Gennady Golovkin (green trunks) and Canelo Alvarez (blue trunks) box during the world middleweight boxing championship at T-Mobile Arena. Kazakh Golovkin and Mexican Alvarez each got the nod from one judge, while the third declared it a draw. Golovkin, who landed more punches overall, remains unbeaten over his career. 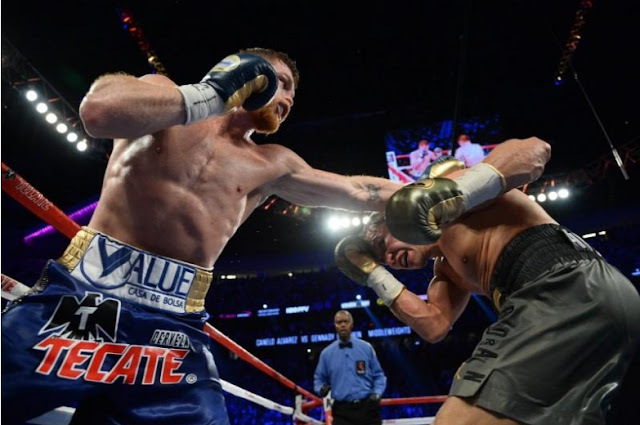 Golovkin started cautiously and then appeared to have the edge in the middle rounds, while Alvarez finished with a flurry as the pro-Alvarez capacity crowd cheered raucously at T-Mobile Arena. “Yes, of course, if the people want it,” said Alvarez. It was a close fight and while many experts gave Golovkin the edge, the scorecard of the judge that awarded it to Alvarez 118-110 immediately raised eyebrows. Although it was perhaps not the all-time classic that promoters had touted, as both fighters clearly respected their opponent too much to risk leaving themselves vulnerable to a knockout. Golovkin occupied the center of the ring mostly, while Alvarez was more comfortable near the ropes, content for the most part to counterpunch. California-based Golovkin, widely known by his nickname ‘GGG’, had an edge in jabs, but neither fighter came close to delivering a knockout. Gennady Golovkin and Saul ‘Canelo’ Alvarez fought to a controversial draw in their long-awaited middleweight world title bout in Las Vegas on Saturday. Kazakh Golovkin and Mexican Alvarez each got the nod from one judge, while the third declared it a draw. Golovkin, who landed more punches overall, remains unbeaten over his career.